It is no surprise that, as part of its revised growth strategy presented in June, the Japanese government has announced it will reduce the corporate income tax rate. At more than 35 percent for most businesses, the Japanese rate is one of the highest among the industrialized countries of the Organization for Economic Cooperation and Development (see Chart 1). Moreover, at a time when Japan needs to boost economic growth, the corporate income tax rate is generally seen as the country’s most growth-distortive tax. But can Japan afford a lower its rate? 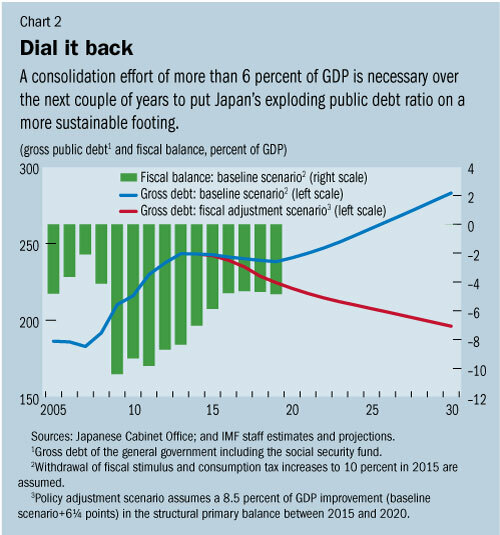 In its latest staff report for Japan, the International Monetary Fund argues that a consolidation effort of more than 6 percent of GDP is necessary over the next couple of years to put the exploding public debt ratio on a more sustainable footing (see Chart 2). This adjustment would reinforce other already planned measures, such as the next consumption tax rate hike to 10 percent in October 2015. How then, can Japan talk about lower tax rates as an engine of growth? Revenue losses could potentially be substantial. Reducing the rate by 5 percentage points—without offsetting measures—could lower revenue by some 0.4 percent of GDP. Some proponents of a rate cut claim to have an easy solution to cover this revenue loss by arguing that a lower rate will ultimately be (more than) self financing. Inspired by Arthur Laffer, they believe that reducing the rate would lead to such an expansion of the base that revenue will ultimately increase. A recent IMF Working Paper rejects such claims, however. Indeed, our reading of the large empirical literature on corporate tax elasticities suggests more modest effects on the base. For instance, as a consensus estimate, we find that a 5 percentage–point reduction in the rate will raise the level of investment by 3½ percent in the long run (relative to baseline). A plausible estimate is that between 10 and 30 percent of the static revenue loss from a rate cut can be recovered through these investment effects and other behavioral responses (such as income shifting and corporate financial choices). For Japan, tax elasticities have been historically smaller than elsewhere, so that the lower bound might in fact be more likely. While important, such effects are of course far from sufficient to make a cut self financing. Shift toward a higher consumption tax. Even when increased to 10 percent, the consumption tax rate will still be low internationally. As a relatively growth-friendly and stable revenue source in an ageing society (see Keen and others (2011)) further increases may be attractive to finance a lower rate. To address concerns an increase may be regressive, it could be combined with targeted transfers to low-income households, similar to the program the government introduced with the first consumption tax increase. Replace local corporate income tax rates with better local revenue sources. Almost one third of the Japanese rate comprises taxes imposed by prefectures and municipalities. There are far better local taxes to draw on, such as taxes on immovable property, which are more stable, fairer, and less distortive for economic growth. Eliminate distortions for small and medium-sized enterprises. The tax system currently encourages small firms to pay wages and discourages them from paying dividends. More neutrality requires reform of dividend taxes and a lower wage deduction in the personal income tax. With less arbitrage, overall revenue can increase and business structures become more efficient. Broaden the base. Japan has a very large number of special tax incentives, including for small and medium-sized enterprises. Some are ineffective or create distortions. While streamlining incentives is desirable, the expected revenue yield is limited. Moreover, depreciation allowances and loss treatment are not quite as generous compared with other countries, and cutting them back runs the risk of discouraging investment and reducing growth. Reduce the rate gradually. An immediate corporate income tax rate cut creates a windfall gain on past investments. A credible pre-announced rate reduction will reduce such windfalls and limit fiscal costs in the short run, while still encouraging investment. 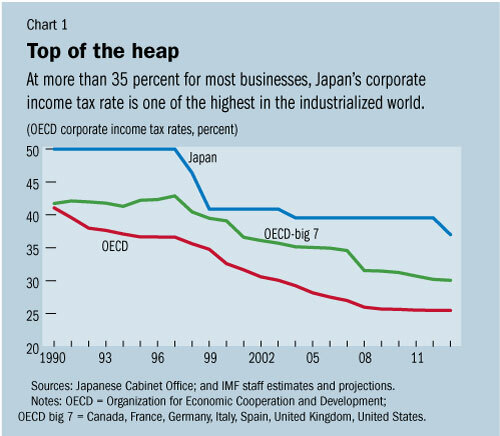 Japan should also consider more innovative corporate income tax reforms to either substitute or complement a rate cut. It could, for instance, follow Italy’s example by introducing an incremental allowance for corporate equity (ACE)—a deduction at a fixed notional rate for equity increases through either retained earnings or equity issuances—relative to some base year. The incremental allowance does not grant relief on past investment and, therefore, incurs little fiscal cost in the short run and grants no windfall gains. Still, incremental investment is significantly encouraged. This is exactly what Japan needs. The allowance has further appeal in that it eliminates the inherent tax discrimination in favor of debt over equity. It is for these neutrality properties that allowance has become the “love baby” of public finance economists. Recent experiences in Italy and Belgium are encouraging regarding their practical implementation. Fiscal constraints are acute in Japan. But so is the need for boosting growth. Hence tax reforms should aim to maximize the growth effect per yen of tax relief granted. That may require unconventional policy. Indeed, scarcity should provoke innovation —in tax policy as much as in any other field.